The EuroCup Women is now in the knock-out stages. The matches are played over two legs under the aggregate score rule. The first leg is played at the home of the team with the lower ranking. Tarbes, the best ranked French club in the competition, had to travel to Bosnia for the first leg to face BC Zeljeznicar. They took their time to settle into the match and once done they put away their opponents. The home side made the best of Tarbes’ difficulties at the beginning to open (11-2). Tarbes’ only point came from the free-throw line, courtesy of Liz Moeggenberg. Zeljeznicar increased their lead (18-6). Tarbes then started to take control and scored the last 5 points of the first period. Now warmed up Kristen Mann and Gisela Vega (in picture) went to work offensively as Tarbes hit their guests 29-11 to go into the interval (40-29). Mann top scored with 23 points and Vega contributed 22 as Tarbes took a 22-point lead into the second leg of this FIBA Europe EuroCup Women match (80-58). Challes-les-Eaux took a 12-point lead into the second leg as they outscored the Russian side Nadezhda (63-52). Jessica Davenport compiled a double-double, 23 points and 12 rebounds to lead the scoring. She was joined in double figures by Tiffany Jackson (left in picture) with 16 points and 15 rebounds. Slavka Frniakova scored 18 points. Lattes Montpellier’s poor first quarter start (10-24) cost them the game as they used up a lot of energy playing catch-up. Montpellier made up the deficit at the beginning of the fourth quarter and briefly took the lead before running out of steam allowing Panionios from Greece to win the game (67-62). 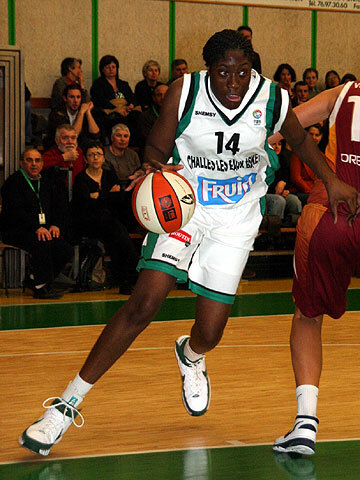 Sandra Dijon’s 14 points were not sufficient for Montpellier to take the game. A bad patch during the third period by Aix-en-Provence was all that Galatasaray required to take hold of the game (65-52). Ines Kresovic led the scoring for Aix with 15 points while Sophia Young from Galatasary had 20 points. Pictures courtesy of FIBA Europe.